After a slow start to the season, the Crook County Cowboys are playing solid baseball. The Cowboys went 2-1 at last week's Grant Union Invitational and had a chance to win the tournament championship. After a tough 6-5 loss to Dallas in the tournament championship, the Cowboys could have had a letdown. However, that's not what happened. 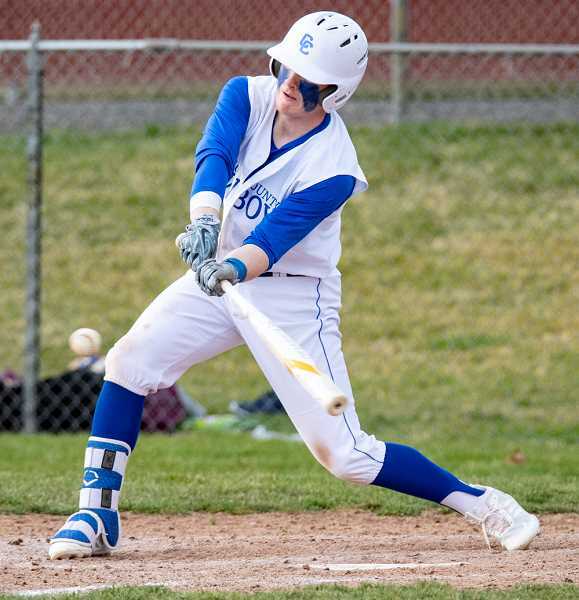 The team came out on fire Tuesday afternoon as they scored four early runs, then held on to take a 4-2 victory over Forest Grove at Davidson Field in Prineville. "It was really nice," Crook County head coach Kramer Croisant said of the win. "Our bats came out, and we scored four runs in the first two innings. That was nice for sure, but I was telling the guys that we need to continue to take every at bat seriously for the whole game." After holding Forest Grove scoreless in the top half of the first inning, the Cowboys quickly went to work offensively. After a long fly out, Hunter Bishop ripped a double to right field. Bishop advanced to third on a wild pitch, then scored on an Ethan Cossitt single up the middle. The Vikings threatened in the second inning before Crook County shortstop Kyle Knudtson ranged far to his left to snare a ground ball, stepped on second base for a force out, then threw to first for an inning-ending double play. The Cowboys exploded for three runs in the bottom half of the second inning to break the game open. Starting pitcher Garett Bernard started things off with a single down the left field line. Diego Smith then executed a perfect sacrifice bunt, moving Bernard to second. Forest Grove's first baseman then tried to throw Bernard out after he rounded second base. However, the throw went into center field, and Bernard advanced to third. A strikeout left the Cowboys with two outs. However, they rallied as Louis Durant singled to score Bernard, then stole second base. Brody Connell then doubled to center field, scoring Durant. A Bishop single score Connell for the third run of the inning before Forest Grove was finally able to get the final out. Forest Grove tried to rally in the third inning. Leadoff hitter Alex Mannen reached first on a close play, when the umpire ruled that Crook County starting first baseman Matthew Delapena pulled his foot off the bag. With one out, Jackson Buehler hit what looked like a routine ground ball to short, but Buehler was safe in another close play at first, while a hustling Mannen raced all the way to third. Buehler then stole second before Bernard hit Max Richards with a pitch, loading the bases. Henry Tonges then grounded out to second base, but Mannen scored on the play. However, Bernard was able to pitch out of the jam, getting the next Forest Grove batter to once again ground out to second. Cossitt was hit by a pitch to start the bottom half of the inning but was called out trying to steal second. The next two Cowboy batters struck out, ending the inning. Durant came in to relieve Bernard to start the fourth inning and gave up a pair of singles and a run as Forest Grove closed to 4-2. However, that was the last run that either team would score. Forest Grove had a chance to score in the fifth, but Connell, Crook County's catcher, gunned down a pair of runners who attempted to steal second. The Cowboys loaded the bases in the bottom half of the inning, but a double play ended the inning without any runs. Neither team threatened to score again, as Durant closed out the game with a three-up and three-down seventh inning. Bernard and Duran combined to scatter 10 hits and just two runs in their seven innings of work. 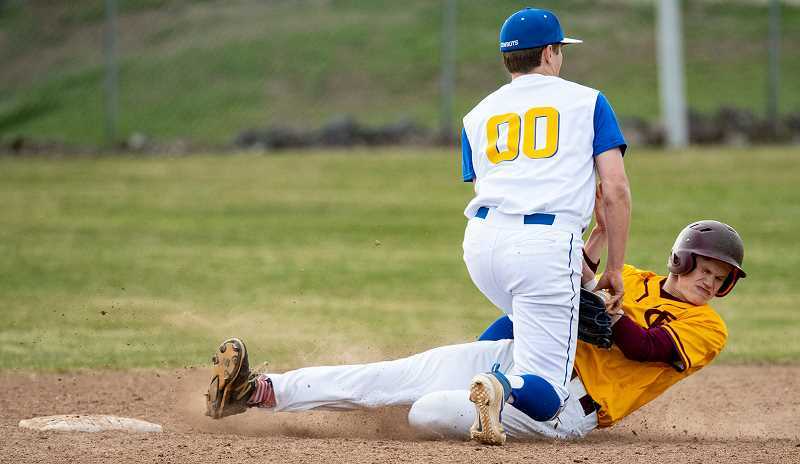 Forest Grove pitchers Henry Tonges and Tanner Nelson limited the Cowboys to just five hits in the game, but the Cowboys made the most of those hits, scoring just enough runs to win. Connell and Bishop each had doubles for the Cowboys in the game as Crook County improved to 3-3 on the season. The Cowboys had no errors in the contest, while Forest Grove committed two. "I think it was important for us to get the win," Bishop said. "We are on the right track for league, and it gives us some momentum." Croisant was also pleased with the victory. "I think we are playing pretty solid, and we are getting better every game," he said. "I think we are in line with where I would want to be, and hopefully we will continue to improve." The Cowboys opened the Madras Invitational Tournament Thursday morning with a game against the host White Buffalos. "We are going into the Madras tournament with good momentum," Bishop said.